Kensi is gone and Deeks is lost without her. Of course, neither Callen nor Sam really help him through the loss of his partner either. They get a new case and Deeks is left behind with little to do. He ends up trying to help Nell and Eric, but he's more in the way than everything. Poor Deeks. 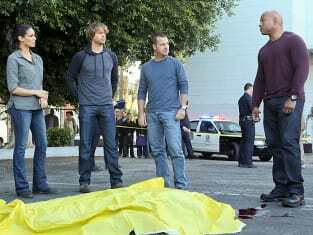 NCIS: Los Angeles Season 5 Episode 11 involved the search for a Romanian war criminal, Anton Zevlos, that had been hiding under a false identity in Los Angeles for decades. When the FBI botched the capture, NCIS was called in to help track him down for the Romanians. The case itself wasn't all that interesting, but it did have a few highlights. Zevlos proved to be adept at staying hidden with the help of his lawyer and lover, Carla Shear. She gave his car to some joy riders to mislead the investigators, which gave him time to hide. Even after they uncovered his only source of money, he was able to escape after killing the banker. I wasn't sure they would ever find him. And they almost didn't because Hetty called them off the case. Callen just couldn't let the man get away. Zevlos trafficked in kids. Callen could have been one of those kids if his life had gone a different direction. The agents disobeyed orders and went after CIA Agent Donald Banks instead. Their con was one of the best the show has done. It was awesome to see Nell in the field again. She's a guy magnet in the field. (Eric needs to make a move ... yesterday!) She could use a vacation, but that was not a plane she wanted to board. Deeks did a good job of serving bourbon and then grabbing Banks' gun from the man's backside. At first I thought Banks would call their bluff about crashing the plane, but Sam, Callen and Deeks were very believable, especially when they opened the door. They OPENED THE DOOR when the plane was flying! And, the plane was on autopilot. At least, the NCIS agents had parachutes on. Banks gave himself up. And the team tracked Zevlos through his lawyer. They were going to run away together, but then he used her as a human shield. I don't think that relationship was going to work out. The team shot and took out Zevlos without harming Shear. Case closed. Only ... they disobeyed Hetty! She's given them breaks before for going rogue, but she finally had enough. She suspended the three blind mice ... for a day. They got off easy. Hetty really needs to get them under control because they go off on their own way too often. Up until this point, it has worked out. If they keep doing it, it's bound (it better) to go bad eventually. While the team in LA was tracking down the war criminal, Kensi arrived in Afghanistan. And nobody there knew she was coming or why she was there. She just hung out not eating Booker's food until Granger showed up. Neither of them are officially in country and have been tasked with a dark op. Kensi is supposed to kill a suspected American rogue private contractor. Wow! That's huge. An assassination order on an American citizen? Who has approved it? And what about justice? This is much more complicated than taking out a foreign terrorist. She wasn't given much to go on, but it has to weigh on her. Plus, she's all on her own. She's used to having a partner by her side and a team covering her back. The unresolved personal situation with Deeks can't be helping her either. They both miss each other. Aww. It was heartbreaking to watch them both looking at pictures of the other. While that was difficult to watch, it wasn't nearly as heart-wrenching as Deeks' offer to leave NCIS for Kensi. He'd give up his job for her. He just wants her back in Los Angeles and with him. Whether she was assigned because of what Hetty thinks happened between them or not, Kensi is where NCIS needs her right now as painful as it is for both of them. It would be helpful if Kensi would just pick up a phone and call him! She doesn't have to tell him where she is or what she's doing. Just check in. She owes it to herself and to him. Though, perhaps that would just complicate matters between them. They are pining for each other. I hope the distance will help them both realize how much they mean to each other. I'm glad that we are getting to see what Kensi is up to in Afghanistan instead of it happening off-screen and remaining a secret. It adds to the intrigue and shows another side of NCIS and the military. Kensi's still on NCIS: Los Angeles and she hasn't given up on Deeks. This just adds to their romantic journey. What do you think about the current status of Densi? Are you along for the ride? Or frustrated at their separation? Should Hetty have punished her agents more harshly for their disobedience?